The 2011 Chickasaw Silver Uncirculated Coin will be the last of five 2011-dated strikes of the series to appear from the US Mint. 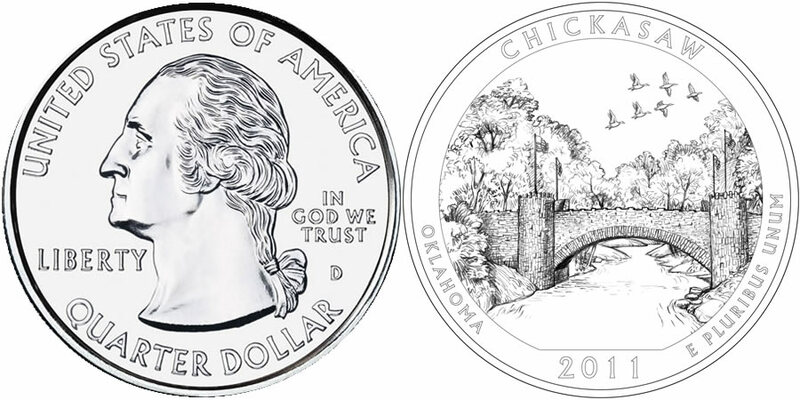 It honors Chickasaw National Recreation Area of Oklahoma with a design showcased on its reverse. These coins are part of the Mint's America the Beautiful Five Ounce Silver Uncirculated Coin series, which are struck as the collector grade versions of the America the Beautiful Bullion Coins. Both are composed of five ounces of .999 fine silver and feature a diameter of three inches. Both also contain obverse and reverse designs similar to a third series of coins from the Mint - the America the Beautiful Quarters® Program. This specific strike honors Chickasaw National Recreation Area which was originally established as Sulphur Springs Reservation on July 1, 1902 from 640 acres of original land bought from the Cherokee Indian Nation. It was redesignated a national park in 1906 and redesignated again to its current status in 1976. Inscriptions of UNITED STATES OF AMERICA, LIBERTY, IN GOD WE TRUST and QUARTER DOLLAR are found on the obverse of all of the America the Beautiful coins along with a portrait of George Washington. John Flanagan designed the portrait of the first President of the United States and it has been used on the quarter dollar since 1932. 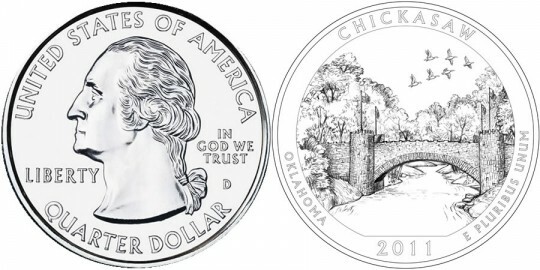 A depiction of the Lincoln Bridge of the Chickasaw National Recreation Area is shown on the reverse of the coin. Surrounding the limestone bridge are the inscriptions of CHICKASAW, OKLAHOMA, 2011 and E PLURIBUS UNUM. It was designed by AIP Master Designer Donna Weaver and sculpted by United States Mint Sculptor-Engraver Jim Licaretz.